' Of course you can just set it up; but there are two other methods, both starting from new-deck order. In one of them some faro shuffles are required; in the other (very simple) method, the cards are dealt out onto the table (an antifaro). Open a new deck or start with the cards set in new-deck order. The initial order we will require to reach the Mnemonica stack is, from the top down: a¥-KV, K*-A*, K4-A* (Fig. 2). 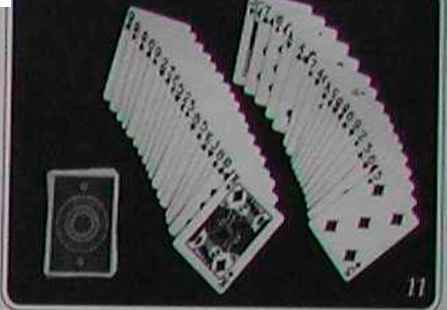 The factory order of American decks made by the U.s. "
Playing Card Company is different, running from top down: A¥-K¥, A*-K*, K4-A4, K*-A4, and must be altered in this manner. 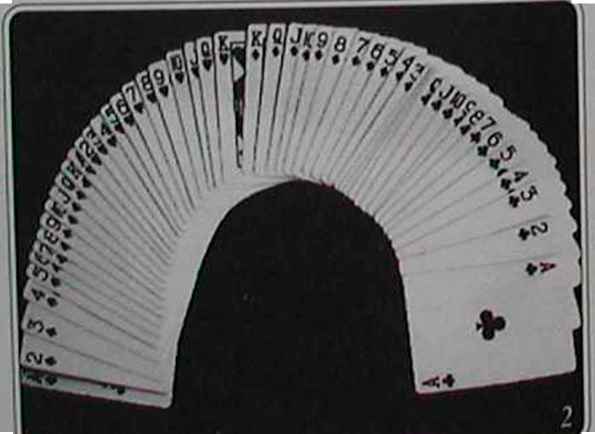 With a face-up overhand shuffle, run thirteen cards (the spades) from the face of the deck, reversing their order, and throw the balance onto them. •SdS2L? i'r< Shuifle- <*"> shuffle is taught in many of our texts;one 135). Xout" «, 'Und m Giobbi's Card College. Volume 3 (1998, ChaP"
" » St" «P^mente. you can't do a faro shuffle, Method y -i, noa-raro procedure. Immediately begin a second face-up shuffle by chopping off a block of thirteen cards (the diamonds). You can do this quickly and easily by first raising three-quarters of the deck or a bit more. A glance will tell you how accurate you have been: The K* should be on the face the right hand's raised portion. If one or more diamond cards lie in front of it, use your left thumb to drag them down behind the left hand's quarter of the deck. 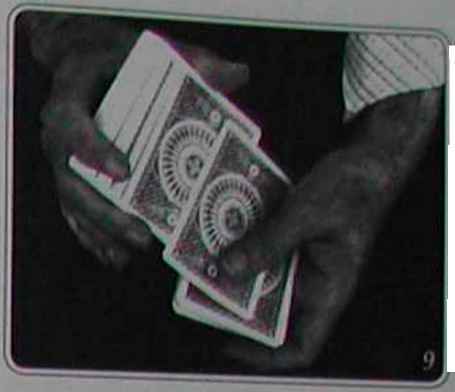 Without hesitation, run the thirteen clubs, reversing them, onto the left hand's diamonds, throw the right hand's balance beneath the left hand's half—and the cards will be in the required sequence (Fig. 2). Give the deck four out-faros to create the order shown in Fig. 3. This, by the way, is a stay-stack order. Reverse the order of the top twenty-six cards to arrive at the order shown in Fig. 4. Cut off the top eighteen cards (cutting under the K4) and out-faro this small packet into the top portion of the large one (see Figs. 5 and 6). 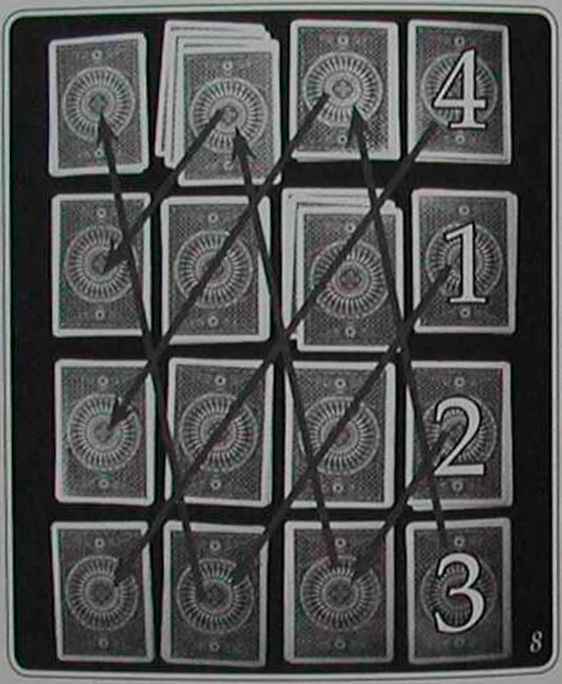 Cut at the and transfer these nine cards from the top to the bottom to arrive at the order shown in Fig. 1. This method of setting up, as well as the other methods described, can be accomplished in front of the spectators. I 'll say more about this in a minute. After this split the deck exactly at the center, between the two black Nines (starting from the order shown in Fig. 3) and run the top eight cards of the upper packet singly onto the lower packet (Fig. 9). Drop the upper packet again on top. Finish by cutting the 9+ to the bottom. Fig. to0! rirhUifle' SlidC the t0P and **>»<»» cards off the deck together, as in Vwi could atd ^'r':l,U'tebled Packet- this action until no cards are left, card and a bottom ,h . ^ °mhand shuf^- drawing the cards Off in pairs (a top onto the taMedone " ° ^ ^and wh™ finished, drop the shuffled packet t Alio mc Appendix U, No. 4, p. 285. 2. By undoing the eighteen-card partial faro (Fig. 5) in the First Method (HI explain a simple way of doing this later) and reversing the order of the top twenty-six cards, we arrive at stay-stack order (Fig. 3). Thus we have available to us all the tricks using stay-stack, of which there are dozens in the magical literature. I will later describe some wonderful divinations, a missing card effect, coincidence effects and memory stunts, all based on stay-stack. 3. If, from this order, we do another four out-faros (or a quadruple anti-faro) we are back to the initial new-deck order by suits, colors and values shown in Fig. 2. This will be used as a superb climax for a closing effect. Believe me, it's a solid blockbuster. These three features are already very practical and magically powerful. 4. 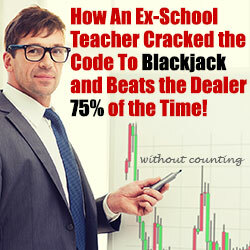 A dramatic poker demonstration, including a story and magic. (sometimes giving other good hands to other players). This is very dose to the dream of any gambler-or to a mag,can presenting a gambling demonstration. 6 Blackjack, rummy, poker and bridge demonstrations. 7 Yet another poker demonstration for eight players, with attractive hands for all and an amusing finish. 8 A version of the celebrated "Vernon Poker Demonstration", with its whole inner construction and its dramatic and magical ending. 9 A surprising routine of coincidences that demonstrates and foresees great luck for the spectators and the magician. 10. A deal of three hands in which the complete suit of hearts, clubs or spades falls to the magician. 11 Another excellent routine, this one finishing with the complete suit of diamonds. 12. Spelling: By exchanging the positions of two consecutive cards, you'll have a group of ten cards in which the name of every card spells with one more letter than the previous one. It allows you to perform the wonderful and well-known effect of a thought-of card that turns up as its name is spelled. 13. Other spectacular spelling effects, in which all the Deuces or several chosen cards turn up, or suits and values are spelled. 14. Achieving a sequence of alternating colors (red-black-red-black...), or alternating pairs of colors (red-red-black-black...), or even three by three. This is only applicable to the top twenty-six cards. Such arrangement makes possible several effects, and you can blend them into a routine with Bill Simon's "Call to the Colors" or Ascanio's version of that effect. After several Mnemónica trick, í Z h1° lhe0pp"ite selected from the top thir.y-siv ,nd it ,h° boltom-1 a card glimpse the previous one in ^e ack Y n ' ^ "
Say, I think I already know—your card is in this packet..." Point to the packet that contains the card. "...and it's..." Hesitate and look at the spectators. "...this one." Point at the selected card without taking it completely out of the packet. Lay the 5t packet onto the K4 packet. 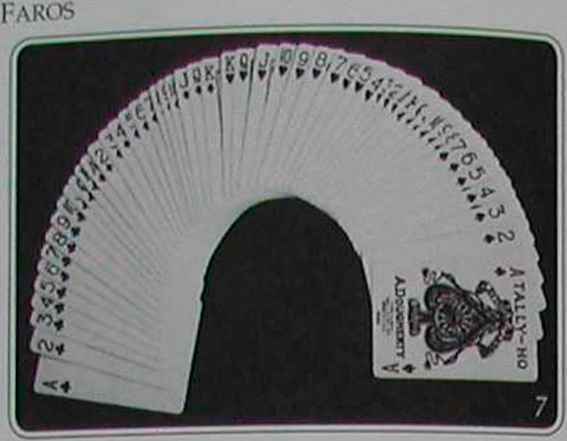 Turn this combined packet face down and set it on top of the undealt cards. 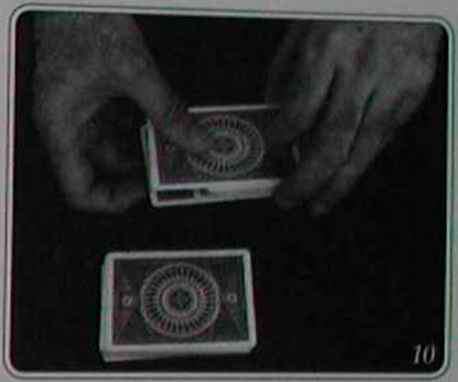 • See the glimpse techniques in Appendix VI, p. 327.
cards for a divination of three thought-of cards; rummy, poker, bridge and blackjack demonstrations; a version of The Vernon Poker Demons^,! Hon"; other productions and spellings for the Aces, Kings, Queens and Jacks, spellings to several selected cards, the four Deuces, colors, suits values, etc. Incredible hut true. Read on and enjoy the mysteries contained in Mnemonics which is truly a wonder—although I am her father, and you know how fathers tend to exaggerate. What is the order for a deck of cards? How shuffle back to New deck order? How to decompress a number sequence lzv?